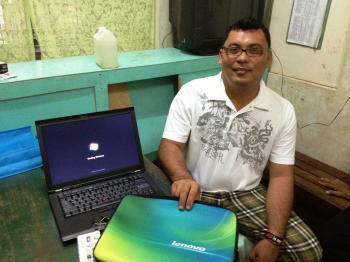 LifeNets has donated a laptop computer each to two prisoners serving life sentences in the Philippines. This is a heart-rending story of a brother and sister who were associated with a family trafficking in drugs. I visited them both on July 14, 2013 and heard their story. (My blog from this past summer follows at the end of this post). We are hopeful that their cases will be successfully appealed as their only connection with drug trafficking was a family one. They have served nearly 10 years of their sentences. 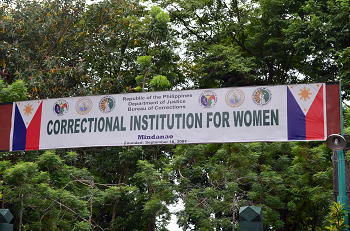 In this time they have earned the greatest trust of the prison administration. They both are used by the prison administration to manage other prisoners. 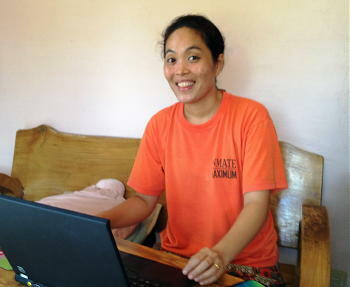 They have now been allowed to own a laptop computer and have limited Internet access. 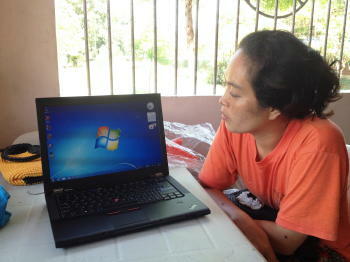 LifeNets gave them each a computer to help life be a little better. I wish you a happy Festival! Though this greeting will be late already when you’ll receive this message, I just want to share how wonderful and meaningful this day to us. I was done preparing my food for tomorrow, just finished my early dinner, when Roy Gilos from the Philippines office called me that he already gave your promise to Jong and he is on the way to our facility. 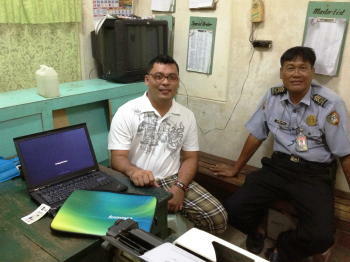 He will be coming tomorrow early morning before the Holy Day service (here in Sto. Tomas, Davao del Norte). I felt so very excited and what a beautiful treat for us! It’s actually a double treat because first, this fesitval reminds us that it won’t be long when this present evil age will be change into a perfect world of peace and happiness, and secondly, your gift arrived exactly on this date. We’re so blessed and every time I meditate on His works, I always tell God, You’re too marvellous and amazing! Each and every moment of our life is truly a mystery. We can’t just imagine what is going to happen next, how He can ma ke things possible and what awaits to those who hope in His promise. After your visit this summer, we were overwhelmed how our great God cause all things to happen. Jong and I often discussed how amazing, how faithful our God that even in our distressing situation, He brings out the good that we may come to know that there are things that we thought is right and good but along the way He showed us THIS IS HIS WAY AND HIS WILL. We Thank God for His grace and mercy that allow us to realize all things He wants us to learn. Actually, there is a story behind why Jong is able to conclude that God’s will must prevail because if he remains stubborn and did not hid my advice to wait he could not have this wonderful gift now which is far better from he expected to have. Unexpectedly, we are much blessed to have one each! You’re an angel Mr. Kubik…. In His time we have it as we need it now! I actually shared my reflection to Roy that it was purposely set by God that the cooling jug was left and you had to go back to get it. 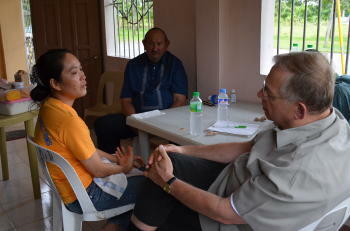 It was a simple conversation with Mr. Macaraeg and you heard it only to realize God’s amazing purpose for you and for us. Though we just can’t use it anytime but we make sure that when we will be given the chance to connect, we will keep in touch with you and our brethren around the world. We can readily update you our wellbeing and much more we can get updates of our church literatures, download Beyond Today programs and other activities. The unit will also be helpful as office orderly (this is the term use for inmates given assignment to assist in office works). This is one of the best privileges we avail being trustees of the institution. It helps us a lot to grow spiritually and continue to walk in integrity despite the stormy challenges we have to face. It’s never easy but with His grace and mercy, we find strength and refuge to hold on. 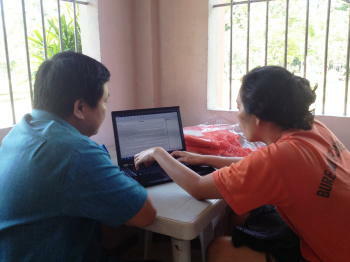 We deeply appreciate and gratefully acknowledge the overflowing support of our brethren around the world. We may not know them personally but what we have experienced each moment of our life simply reveal that your silent thoughts and prayers avail much. My letter is quiet long. Have close for now. The encoder might get tired. I’ll connect to you as soon as possible. Thank you very much for making all these things possible. Probably after the Feast of Tabernacles, we will be able to continue our Q & A. Meanwhile, I pray for His divine intervention to the works of the church especially in preparation for the upcoming Feast of Tabernacles. Mr. Kubik, We are truly grateful for counting us as your little flocks behind bars. To God be the Glory. The story is far more than just being in prison. It's a story of faith and hope and example of what Christians sometimes must endure because of the imperfections of man's government and justice. I will write more about these two people in separate web stories, but wanted to give a brief description of our visits and about them. Six were killed. Sy's husband was not among those killed and it is unknown what happened to him. It is felt that the police had caught up with him later and killed him. Jed, however, was seized and charged and sentenced to life imprisonment by a an extremely harsh administration in this part of the Philippines. She was not involved in her husband's activities. She had grown up in the Church, but married a Chinese man against the advice of her minister. They were married for four years and had a daughter Tin Tin who is now 12 and is cared for by a relative. Jed has now been imprisoned for nine years. Her case is under appeal, but those wheels of justice are turning excruciatingly slow. However, there have been hopeful signals that the appeal is "moving" forward. Her brother Jong (Jingjong) was also arrested. He was charged only because he was a relative. In both their cases there was never evidence proving their guilt. This is not the United States where you are innocent until proved guilty. In this case they had to "prove" that they were innocent. Being married to and part of family was the overriding strike against them. In each of their respective prisons both have risen to a position of respect and trust . 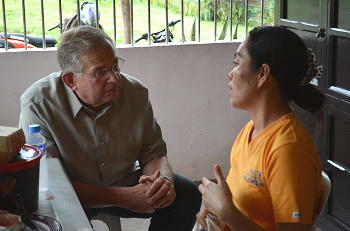 Both manage other prisoners and provide hope and counsel for them. Jed by profession was CPA (certified public accountant). She is extremely competent and articulate. She likes to read and talk about life. Earl Romer calls them both Joseph in Egypt when he was falsely imprisoned for an alleged relationship with Potiphar's wife. He sat there for months and months...he had risen to managerial status. He was ultimately freed and with the tempered character of patience, divine presence (in spite of the immediate situation) became a noted leader in Egypt. My hopes are that these two will be vindicated. While pictures were forbidden, it seemed like they were "allowed" today. 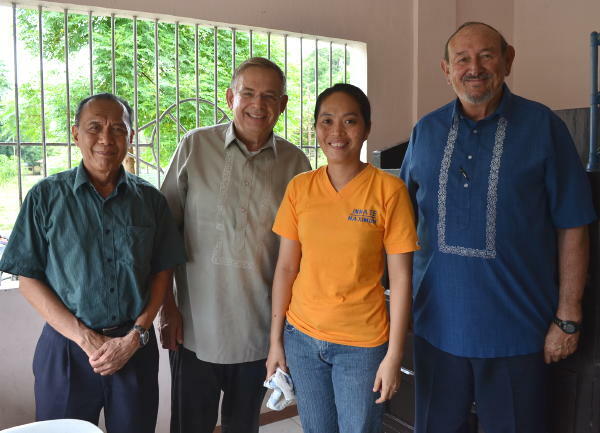 There were four of s visiting Jed today: Ed Macaraeg, Roy Gilos, Earl Roemer and myself. Roy and I got some photos that we are sharing with you. After our visit with Jed, we went on to the men's maximum security prison a few miles away. We drive through miles and miles of banana plantations. The prisons and the plantations are purposefully close as many of the inmates work the plantations. The bananas on the trees are in chemically treated sacks to protect them from pests and to make them look good for market . 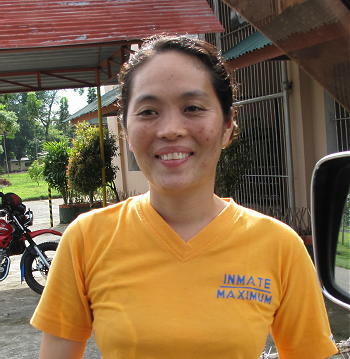 Jong is the manager of the 500 of the most maximally incarcerated inmates. He is greatly liked by the prisoners and management. When we walked into the prison to visit him, there was immediate positive recognition of him. Because of a mix-up in visiting hours, we only had a little more than half an hour with him, but it was very enjoyable. He is very likable and engaging in conversation. He has been given great privileges including access to the Internet and his own Facebook page! I just asked him now to be my friend. 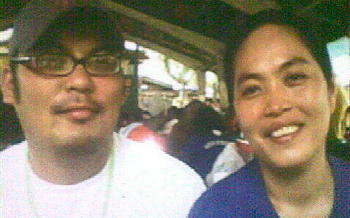 He is even able to visit on occasion with his sister Jed Sy. This month has been hard for him as he was going through a bout of depression of the unending state of his state. He's "ok" now, but really cried out in desperation to God like David did in the Psalms: How LONG, Oh Lord!? We also stopped by a nearby location where the United Church of God can be given a parcel of land to build a church building. There is a separate congregation here that has about 30 in attendance. We talked about the possibility of providing a church structure here. The Durian was covered carefully with cellophane, It was carefully opened up and a piece put on my plate by Ed Macaraeg . Indeed it had a strong smell....and you eat it quickly so that you don't have to continue smelling it. Then an immediate transformation occurs. It melts in your mouth and experience and taste is similar to drinking eggnog. That may not be everyone's experience, but it was certainly mine. I was glad to go experience this Durian moment. I"m not even sure I'm spelling it right, but.will fix it on the blog when I get it right.